In a previous post on law enforcement and data visualization, we saw how successful law enforcement agencies understand the wealth of data they have at their disposal. Graphs can reveal trends and give insight into relationships between people, times and locations. 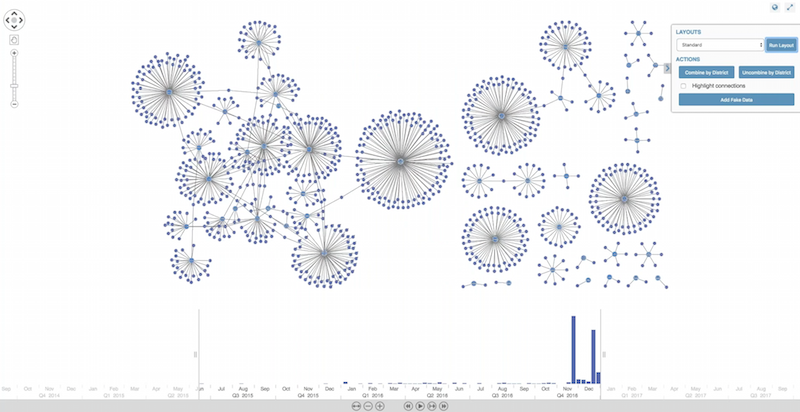 Graph visualization is a vital tool for exploring and understanding graph data at scale. 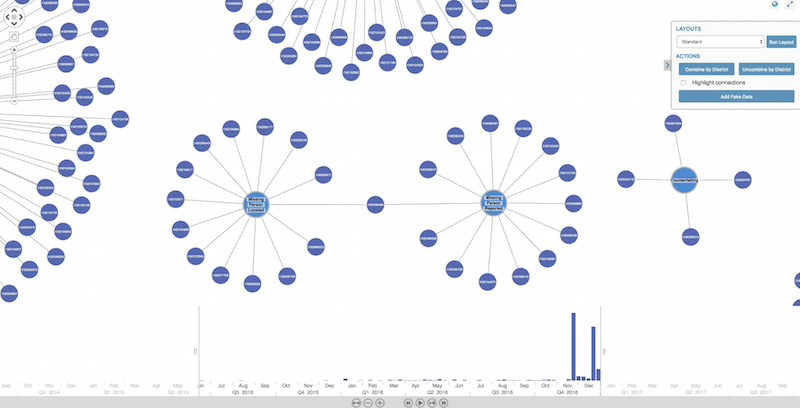 This blog post gives another law enforcement graph visualization use case, and one that I recently presented with our partners at Neo4j. Watch the presentation. One of the many sources of data available to the police is their RMS – or Records Management System. It’s often the core repository, containing details crimes, individuals, officers and vehicles, etc. In recent years, many agencies have made some of their RMS data available to the public – a great resource for anyone interested in law enforcement activity. 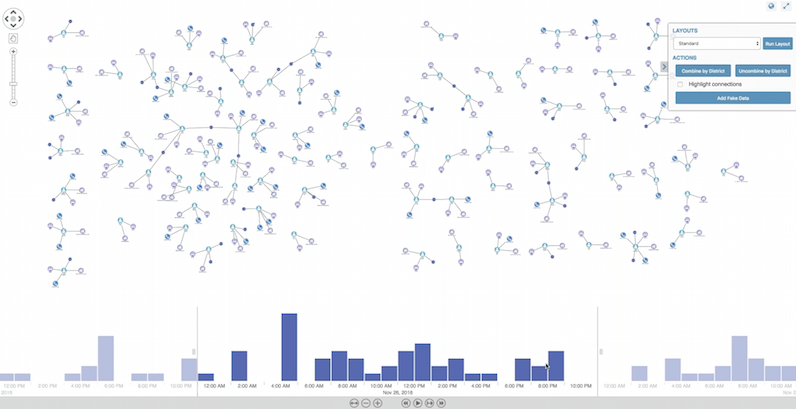 Obviously, identifying details are stripped out, but there’s still enough data to build a valuable graph visualization. 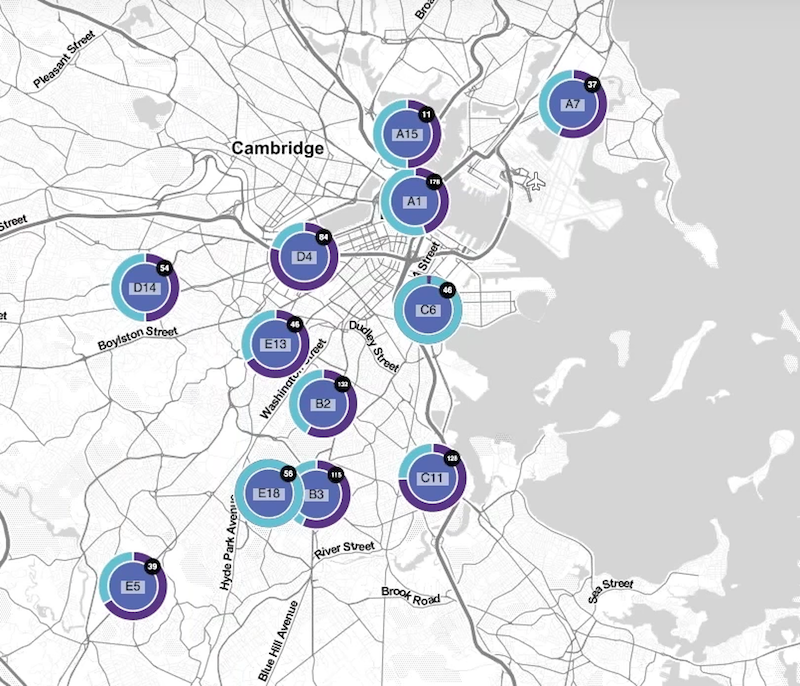 One example of this is the data.boston.gov initiative, detailing real-life crime incidents in the city of Boston. Once I’d loaded this dataset into the Neo4j graph database, I could use Cypher query language to quickly and easily query the data. I used the Neo4j Awesome Procedures on Cypher (APOC) capability to call the data.boston.gov API, pulling in a JSON object detailing 1000 records. 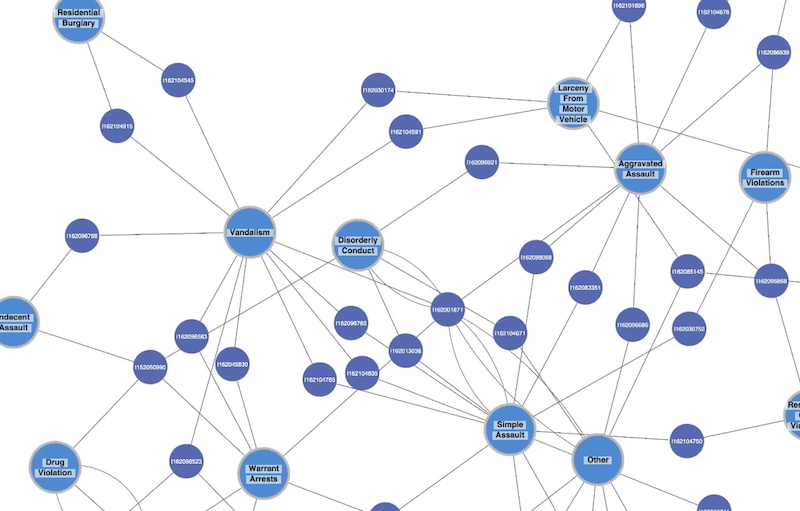 APOC provides a flexible way to ingest data into Neo4j with a few lines of Cypher. I used Incident Number fields as the core nodes with additional attributes, like offense group, district, date, longitude and latitude. This doesn’t suggest that the police have problems locating missing persons; it’s probably due to our limited dataset. With full access to the data, we might use a double-click to expand method to see the full picture. There was a District property in our original dataset, so we can incorporate that into our visualization. 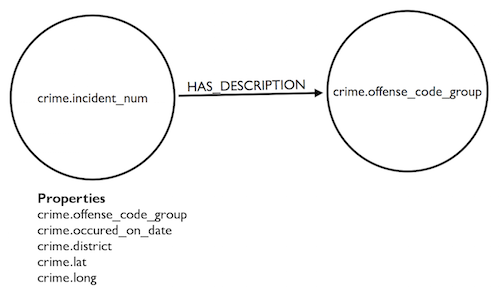 I’ve also added donuts to nodes to show the volumes of different reported crimes. I’ve included two crime categories – Larceny in blue, Motor Vehicle Crime in purple – but we can already see some stark differences in our dataset. South Boston (C6) has a much higher proportion of Larceny than East Boston (A7). The fake data doesn’t reveal much insight, but it demonstrates the potential value of this approach. An officer can visually explore phones, addresses and individuals connected to incidents to see how they relate to previous incidents. Storing data in a Neo4j graph database means we can run complex graph queries that would otherwise be incredibly time-consuming. “Return all individuals in district D4 who have previously been associated with a vandalism crime in 2017 who drive a red Ford” becomes a fast and simple Cypher query. 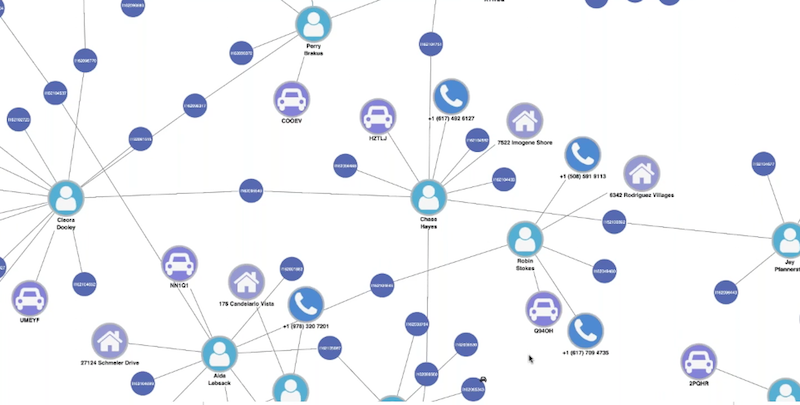 KeyLines and Neo4j combine to become an effective and efficient tool to help officers make the best use of their data. 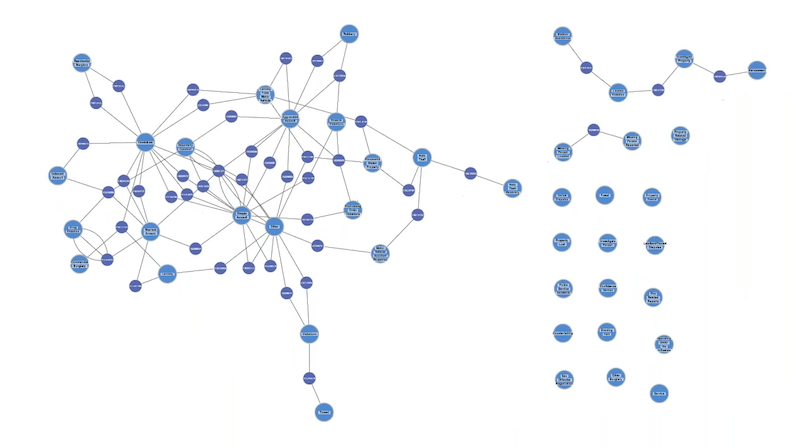 This post is just an illustration of how graph visualization techniques can help law enforcement to understand the complex connected data. We’d love to see how this approach works using real-world data. If you’d like to try KeyLines for yourself, just start a trial or contact us.